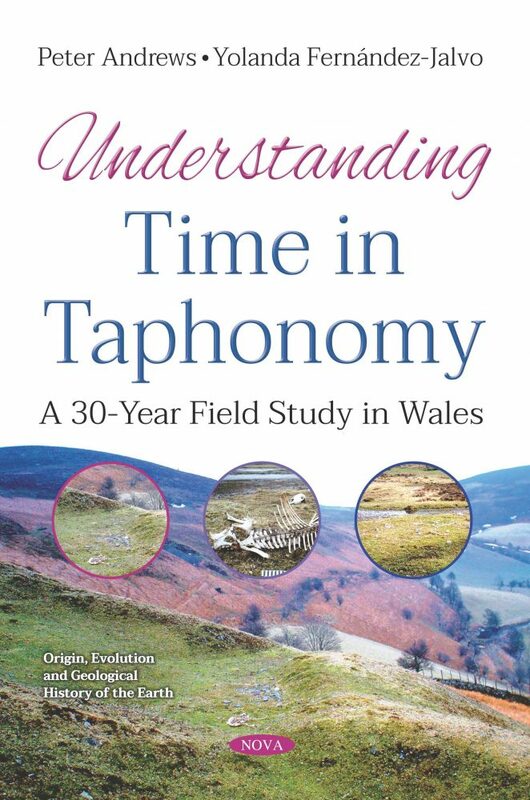 Understanding Time in Taphonomy investigates time as it affects taphonomy. All taphonomic agents operate through time, which may be long or short, so time adds another dimension to taphonomic change. The processes and modifications recorded in fossils can tell us how long the fossils took to accumulate and the geological/biological/ environmental context in which they fossilized. Measuring time in taphonomy requires long-term studies of taphonomic processes operating at the present time. In 1976, one of the authors (PA) started a 30-year monitoring project of animals that died natural deaths at Neuadd in Wales. The study area of 680ha of upland heathland, woodland and rough grazing were monitored. Over 100 sheep, horses, foxes, badgers, rabbits and small mammals were monitored, but only 56 yielded useful results. 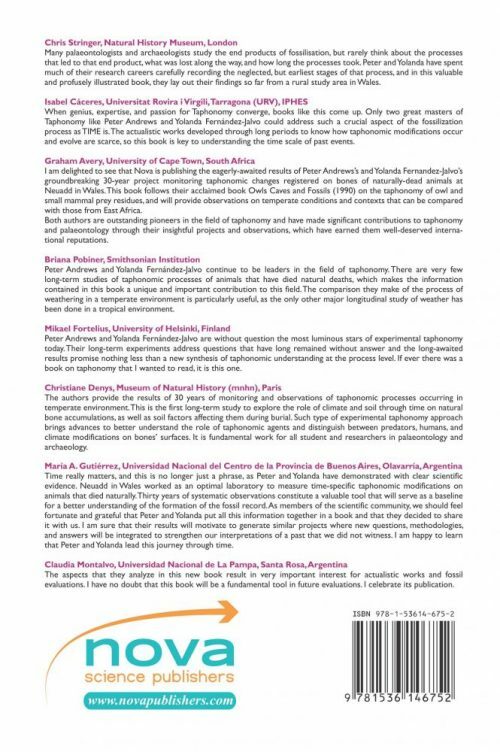 YFJ has also begun a similar study at Riofrio in Spain, and other long-term studies are reviewed. This 30-year study highlighted several time-specific taphonomic issues. Trampling of Neuadd specimens produced pitting and superficial scratching found commonly on fossils. Longer striations mimicking cut marks are common, particularly on bones in rocky substrates. The number and morphology of these pseudo-cut-marks are compared with cut marks made during human butchery. There is only a weak relationship with exposure time. The extreme effects of water and wind at Neuadd quickly dispersed body parts. Modifications similar to trampling and butchery were produced in running water. In still water, three modification stages are identified: Stage 1, which is 3-5 years with broad flaking; stage 2, 10-12 years with extreme flaking and loss of surface bone; and stage 3, >18 years with deep tissue loss. Weathering at Neuadd has a time-scale that is different from the one established for tropical environments: At 0-5 years, 92% of bones are unweathered, with 8% at stage 1; at 6 to 10 years, 73% of bones are unweathered, with 27% at stage 1; at 15 to 25 years, 17% of bones are unweathered, with 63% at stage 1 and 20% of bones at stage 2; at 30 to 35 years, only one skull survived, and it is at stage 1 weathering. Monitoring of buried bones at Neuadd shows three time-scales of modifications resulting from soil corrosion: Progressive corrosion under dense vegetation cover with high humidity from 2 to 23 years; increasing root marks from 2 to 23 years; and corrosion from the action of lower plants such as moss and algae in 3 to 11 years. The extent and sizes of carnivore and herbivore chewing marks was found to have no usable timescale. Dispersal of bones is slow at Neuadd and is related strongly both to the nature of the environment and to the size of the animals. Three timescales have been identified: Dispersal over 15 years is greatest for large animals in open environments, lower for medium sized animals like sheep, and the least for small and medium size animals in dense vegetation. Future monitoring projects could use electronic marking chips on single specimens, camera traps, GPS, the Global Weathering Project, radioactive markers on bones, and aerial mapping, backed up with experimental work in controlled conditions.